This month’s Bonn climate change negotiations will build on 2012’s Rio+20 conference, to ask the sustainable development community the question on everyone’s minds, “what future do you want?” Photo by Africa Renewal/John Gillespie/Flickr. 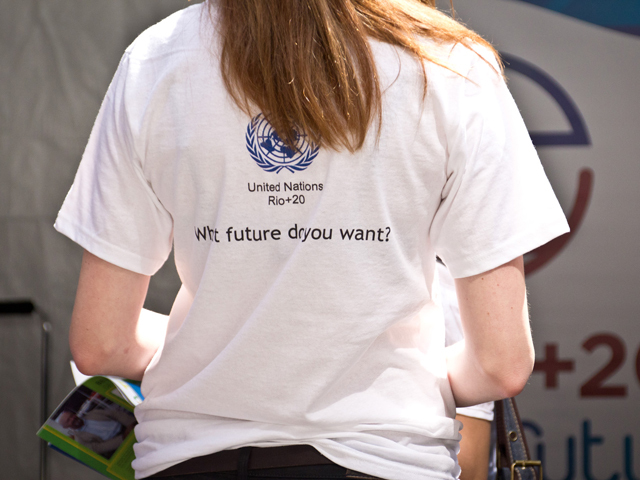 From June 4 – 19, 2014, environmental leaders, policymakers, and the international climate community will descend on Bonn, Germany for the intersessional negotiation of the United Nations Framework Convention on Climate Change (UNFCCC). This event is a chance for leaders from around the globe to formulate clear goals for how their countries will contribute to the global fight against climate change in the context of the sustainable development agenda. Although much of the primary dialogue is focused on getting countries to solidify the goals they will submit to the United Nations (UN), there are some action-oriented developments stemming from the events surrounding the actual conference. Here, leaders delve into the far more tangible topic of how some of these climate change goals can be achieved. Highlights of progress that excites us at TheCityFix includes the launch of the Open Climate Network, Venezuela’s dedication to incorporating civic voices into climate change policy, and a focus on the role of gender in creating resilient communities. Some of the most exciting developments at Bonn occurred at side events. One of these is the introduction of the Open Climate Network, an initiative spearheaded by the World Resources Institute (WRI). The network brings together independent research institutions and civil society groups from countries around the world to monitor national progress on climate change policy. This is important for two reasons: the network aggregates research on best practices on such topics as financing sustainable energy projects, which can help countries learn from each other. The network also keeps data on how well countries are fulfilling their carbon reduction goals, and this accountability is key for pushing countries to fulfill their goals. More inspiring news comes from the Venezuelan camp at Bonn. Outside of its formal participation in UNFCCC negotiations, Venezuelan representatives are hoping to empower their constituents through a “Social Pre-COP” designed to tap into the public’s ideas on gender, health, ethics, and how these topics relate to climate change. The hope is that the policies implemented will help all citizens adapt to climate change, and not simply those with the greatest political clout. Gender also played a new role in the conversations leading up to Bonn, which shows an important realization of how some groups are likely to feel the effects of climate vulnerability more than others. The scope of the meeting on gender touched on what current tools there are to integrate gender-sensitive approaches into policies, and how policy makers and practitioners can create and disseminate better resources for all genders to successfully adapt to shifting climate patterns. Transport and urban mobility are also present at Bonn through the United Nations Mobility Solutions Fair. In 2004, transport accounted for 28% of greenhouse gas (GHG) emissions in the United States and 13% of all GHG emissions worldwide, and that number has only increased. At the same time, a green, low carbon, transport sector can reduce GHG emissions by 70% without major additional investment. Shaping a more sustainable transport sector is critical in the fight against climate change. If the world can stay below a 3.6 degree Fahrenheit temperature increase, experts believe it will be possible to avoid the worst of climate change’s possible impacts. This means first avoiding the use of transport modes that contribute to GHG emissions in the first place, and making non-polluting modes like bicycling or walking viable options. It also means shifting necessary trips to the most sustainable mode, like high quality mass transport. Finally, it also means improving transport infrastructure and technologies, as almost 95% of the world’s transport energy currently comes from petroleum-based fuels, largely gasoline and diesel. At the foundation of this is developing cities in a way that supports mass transport systems, and more importantly people’s needs. Although Bonn is in many ways a stepping stone to the larger negotiations occurring at the end of 2015 in Paris, it is encouraging to see key sectors like transport and key elements like gender and equity already on the table. Opening up the climate conversation now will build momentum towards 2015 and the establishment of the Sustainable Development Goals (SDGs), making the path to development more sustainable and people-friendly.